« Is Australia Still the Best Country for American Refugees? I’m not a fan of the International Monetary Fund. Like many other international bureaucracies, it pushes a statist agenda. The IMF’s support for bad policy gets me so agitated that I’ve sometimes referred to it as the “dumpster fire” or “Dr. 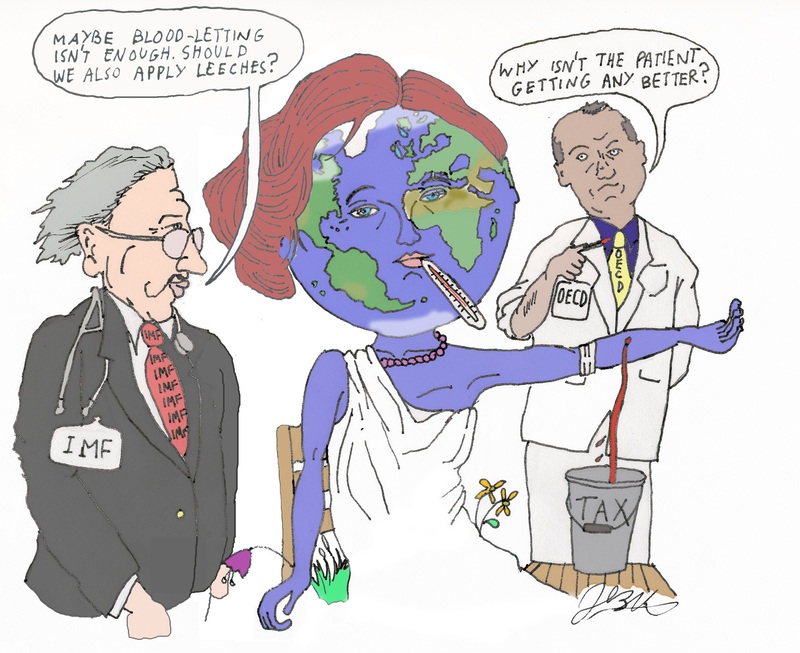 Kevorkian” of the global economy. But, in a perverse way, I admire the IMF’s determination to advance its ideological mission. The bureaucrats will push for tax hikes using any possible rationale. Even if it means promoting really strange theories like the one I just read in the bureaucracy’s most recent Fiscal Monitor. Welfare-based measures can help policymakers when they face decisions that entail important trade-offs between equity and efficiency. …One way to quantify social welfare in monetary units is to use the concept of equally distributed equivalent income. And what exactly is “equally distributed equivalent income”? It’s a theory that says big reductions in national prosperity are good if the net result is that people are more equal. I’m not joking. Here’s more about the theory. …a welfare-based measure of inequality…with 1 being complete inequality and 0 being complete equality. A value of, say, 0.3 means that if incomes were equally distributed, then society would need only 70 percent (1 − 0.3) of the present national income to achieve the same level of welfare it currently enjoys (in which incomes are not equally distributed). The level of income per person that if equally distributed would enable the society to reach the same level of welfare as the existing distribution is termed equally distributed equivalent income (EDEI). Set aside the jargon and focus on the radical implications. The IMF is basically stating that “the same level of welfare” can be achieved with “only 70 percent of the present national income” if government impose enough coercive redistribution. In other words, Margaret Thatcher wasn’t exaggerating when she mocked the left for being willing to sacrifice national well-being and hurt the poor so long as those with higher incomes were subjected to even greater levels of harm. Not surprisingly, the IMF uses its bizarre theory to justify more class-warfare taxation. Figure 1.16 shows how the optimal top marginal income tax rate would change as the social welfare weight on high-income individuals increases. Assuming a welfare weight of zero for the very rich, the optimal marginal income tax rate can be calculated as 44 percent, based on an average income tax elasticity of 0.4… Therefore, there would appear to be scope for increasing the progressivity of income taxation…for countries wishing to enhance income redistribution. But not just higher statutory tax rates. The bureaucrats also want more double taxation of income that is saved and invested. And wealth taxation as well. Taxes on capital income play an equally important role in shaping the progressivity of a tax system. …An alternative, or complement, to capital income taxation for economies seeking more progressive taxation is to tax wealth. The article even introduces a new measure called “progressive tax capacity,” which politicians doubtlessly will interpret as a floor rather than a ceiling. Reminds me of the World Bank’s “report card” which gave better grades to nations with “high effort” tax systems. Though I guess I should look at the bright side. It’s good news that the IMF estimates that the “optimal” tax rate is 44 percent rather than 100 percent (as the Congressional Budget Office implies). 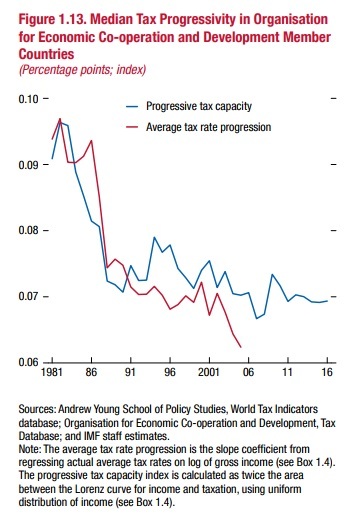 And I suppose I also should be happy that “progressive tax capacity” doesn’t justify a 100 percent tax rate. I’m being sarcastic, of course. That being said, there is a bit of genuinely good analysis in the publication. The bureaucrats actually acknowledge that growth is the way of helping the poor, which is a point I’ve been trying to stress for several years. …many emerging market and developing economies…experienced increases in inequality during periods of strong economic growth. …Although income growth has not been evenly shared in emerging market economies, all deciles of the income distribution have benefited from economic growth, even when inequality has increased. …Benefiting from high economic growth, East and South Asia and the Pacific region, in particular, showed remarkable success in reducing poverty between 1985 and 2015 (Figure 1.8). 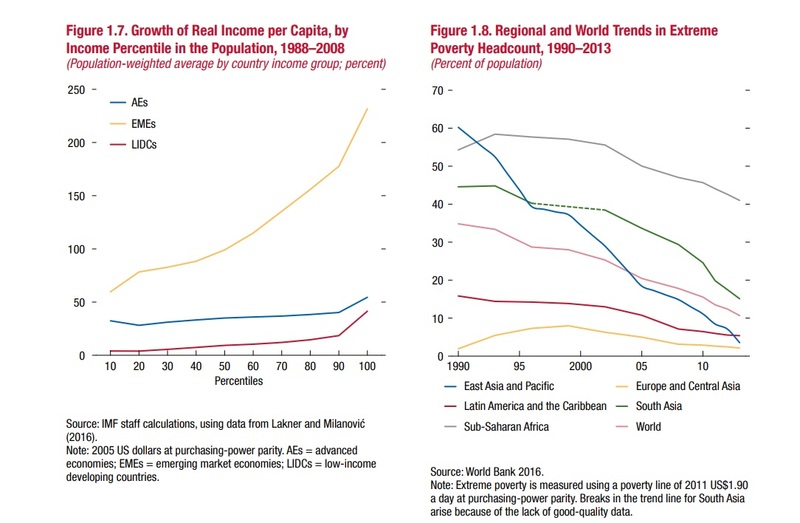 Likewise, a period of strong growth has led to a sustained decline in absolute poverty rates in sub-Saharan Africa and in Latin America and the Caribbean. Here are two charts from this section of the Fiscal Monitor. Figure 1.7 shows that the biggest gains for the poor occurred in the emerging market economies that also saw big increases for the rich. And Figure 1.8 shows how global poverty has fallen. I’m not saying, by the way, that inequality is necessary for growth. My argument is merely that free markets and small government are a recipe for prosperity. And as a nation becomes richer thanks to capitalism, it’s quite likely that some people will get richer faster than others get richer. I personally hope the poor get richer faster than the rich get richer, but the other way around is fine. So long as all groups are enjoying more prosperity and poverty is declining, that’s a good outcome. P.S. My favorite example of rising inequality and falling poverty is China. The poorer half of the population in the U.S. has 0.05% of family net worth. Young adults can’t afford to marry and women abort their babies so they don’t miss any time from work. It is not fine Mr. Mitchell. “They” think that inequality is a problem, but that’s not it. The problem is actually unfairness, most people have little problem with inquality providing it’s been achieved fairly.